25 years after the release of Blade Runner, Ridley Scott has assembled a final and definitive director's cut of the film, giving audiences the chance to see the film as Scott originally intended it.Before the film's original release in 1982, preview screenings went horribly, and the money men stepped in and imposed changes on the aesthetic and narrative. Voice-overs and happy endings were added. New film shot. Dialogue changed. “I went along with the idea that we had to do certain things to get audiences interested,” Scott lamented in an article in appearing this weekend's New York Times. “I later realized that once I adopted that line, I was selling my soul to the devil, inch by inch drifting from my original conception.”This is actually Scott's second attempt at creating a final cut. Back in 1992, he took a first crack at revising Blade Runner. But he ultimately didn't have the time and resources to get the job done as he liked. Now, just in time to capitalize on the 25th anniversary of the film, he's releasing what he calls the final, final cut. The movie will be released in New York and Los Angeles theaters on October 5, and by Christmas, you can buy it on DVD. (Actually, it can already be pre-ordered on Amazon. )If you have a free moment, you may want to watch the audio slideshow that the Times put together on the cult classic as well as the new film's trailer (see below). And to get even more info on this film's making and remaking, see this article by MTV's Kurt Loder. Martin Scorsese is on a rock 'n roll tear. In 2006, he released No Direction Home, an acclaimed documentary on Bob Dylan (long after he filmed his first rockumentary, The Last Waltz in 1978). Next April, he's set to release another documentary on The Rolling Stones, tentatively called Shine a Light. (Watch the already released trailer below.) And now he has just agreed to direct a film about George Harrison. The movie, being made with the support of Harrison's family, will cover his time with the Beatles, his music and film career thereafter, and Harrison's spiritual engagement with Eastern religion. Reportedly, Paul McCartney and Ringo Starr may also contribute to the making of the film. It won't be out for a few good years. In the meantime, check out our recent piece, The Beatles: Podcasts from Yesterday. Social networking is doing some good. In a matter of days, over 110,000 users have joined the Support the Monks' Protest in Burma group on Facebook, with the larger goal of mobilizing support for the Buddhist monks who have launched a peaceful, "saffron" protest against the military regime that seized power in 1962 and has held on ever since. As expected, the government is cracking down on the peaceful protesters, breaking into monasteries at night, torturing monks and throwing them in jail. The Facebook Group offers a specific action plan, and it's effectively bringing visibility to this human rights issue. Log into Facebook (or create an account), join the group here and support democracy in Burma. For a more general account of the human rights abuses in Burma, click here; for daily accounts of what's currently happening in Burma right now, click here. Also please note: International bloggers are preparing an action to support the peaceful revolution in Burma. On October 4, bloggers will refrain from posting to their blogs and just put up one Banner underlined with the words "Free Burma!" Get more information at www.free-burma.org, and if you're a blogger participate and help turn up the pressure. PBS's NOVA recently aired a three-hour mini-series, The Elegant Universe, that introduced TV viewers to string theory - a radical "theory of everything" that unites major laws of physics and offers a unified explanation for everything that happens in the universe. The program was hosted by Brian Green, a string theorist who wrote a runaway bestselling book also called The Elegant Universe (you can read an excerpt here). The program makes difficult concepts quite graspable, partly with the help of dynamic computer animation. And the best part is that you can now watch the mini-series any time you want online (just click here to get the videos). You can also access the complete description of the show here. PS: Here is a great heads up from a reader. "A great complement to the Elegant Universe is the Origins series on NOVA, part of which is also available online. It details the creation of life on earth." The complete collection of NOVA episodes can be found here. Thanks Allen for the good info. Has Stephen Hawking Been Wrong For The Last 30 Years? The MacArthur Foundation recently announced its latest crop of "genius grant" recipients. Each winner receives $500,000 "with no strings attached" and they can use the money to live, to fund research, or to buy a very modest condo in the Bay Area. As usual, the recipients come from a wide range of fields and backgrounds. Reviewing the bios and multimedia clips of these incredibly gifted people, I can't help but be reminded of a great Tom Lehrer quote: "When Mozart was my age, he had been dead for two years." Let me elaborate on an item that we touched upon very briefly earlier this week. Stanford University has rolled out a new free course on iTunes (listen here) that takes you inside the life and adventures of Hannibal, the great Carthaginian military tactician who maneuvered his way across the Alps and stunned Roman armies in 218 BCE. Presented by Patrick Hunt, the author of the newly-released Ten Discoveries That Rewrote History, the class also gives you glimpses into cutting-edge trends in modern archaeology. The course, originally presented in Stanford's Continuing Studies Program, will be rolled out in installments over the next several weeks. Separately you can listen to a standalone lecture that Hunt gave on Hannibal shortly before the start of the course. (Listen on iTunes here.) For more courses like these, check out our podcast collection of free university courses. "Hannibal is a name that evoked fear among the ancient Romans for decades. His courage, cunning and intrepid march across the dangerous Alps in 218 bce with his army and war elephants make for some of the most exciting passages found in ancient historical texts written by Polybius, Livy, and Appian. And they continue to inspire historians and archaeologists today. The mystery of his exact route is still a topic of debate, one that has consumed Patrick Hunt (Director of Stanford’s Alpine Archaeology Project) for more than a decade. This course examines Hannibal’s childhood and his young soldierly exploits in Spain. Then it follows him over the Pyrenees and into Gaul, the Alps, Italy, and beyond, examining his victories over the Romans, his brilliance as a military strategist, and his legacy after the Punic Wars. Along the way, students will learn about archaeologists’ efforts to retrace Hannibal’s journey through the Alps and the cutting-edge methods that they are using. Hunt has been on foot over every major Alpine pass and has now determined the most probable sites where archaeological evidence can be found to help solve the mystery." There was a lot of hand-wringing leading up to Mahmoud Ahmadinejad's appearance at Columbia University on Monday. But, as it turns out, freedom of speech seemingly worked as it was intended. Ahmadinejad entered the marketplace of ideas and quickly came out the wrong side of the exchange. (You can watch the full video of his appearance here or read the transcript here.) The deciding factor wasn't so much the unbecoming introduction offered by Lee Bollinger, Columbia's president. It was more just a matter of giving Ahmadinejad enough rope to hang himself (i.e., letting him doubt the existence of the Holocaust and also gays in Iran) and then sitting back and watching it happen. Of course, the "marketplace of ideas" metaphor only goes so far when you're dealing with international politics. Ahmadinejad's speech wasn't about winning a competition at Columbia. It was mostly about playing to an audience at home, one for whom his rhetorical strategies score points. But then there are the unintended consequences to consider. 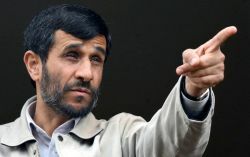 Far better than a discredited Bush administration ever could, Ahmadinejad realistically softened up the American public to any military plans that the US government has on the table. At the very least, this has to qualify for a Darwin Award. I'll save further analysis for the pundits and talking heads since I know that politics and political opinions only go so far on this blog. Last week, KQED's Forum here in San Francisco had a good conversation about free speech in the university. It touched on Ahmadinejad's appearance at Columbia, but also Don Rumsfeld's invitation to Stanford's Hoover's Institution and Larry Summers canceled invitation to speak before the UC Board of Regents. Listen here: iTunes - Feed - Mp3 - Web site.